Escrima sticks are among the most popular martial arts weapons of all time. It’s a formidable weapon for both training and combat, renowned for its speed, flexibility and durability. 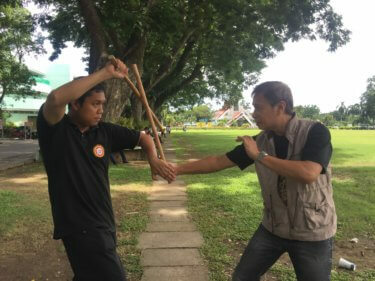 Master Louis Lim doing single stick drill with Grandmaster Melecio Balberde. In this post, we will discuss the technical excellence of this ancient and practical craft. Also, we will give you tips on how to choose the best Eskrima sticks so you can optimize your training with the weapon. 1 Why Use Escrima Sticks? Escima sticks are the primary weapon in Eskrima for several reasons. First, an eskrima stick is a more flexible weapon than the long blades and second, it is more accessible than the bladed weapons. While you can be penalized for bringing a bladed weapon into the mall or out in public, nobody will penalize you for having a stick. Master Louis Lim with Grandmaster Melecio Balberde performing a roof block. The stick wasn’t always the primary weapon in Filipino Martial Arts history. There was a time when eskrimadors and Filipino warriors used the sword such as the “kris” or long blade as the primary weapon. Even during the early Spanish period, Eskrimadors practiced more with bolos (machete) than the stick. 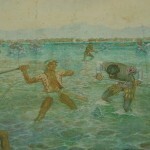 But because the Spanish colonizers banned Eskrima and prohibited the Filipinos from brining bolos and blades except for livelihood purposes, the Eskrimadors had to use kali sticks while practicing the art in secret. This radical shift in primary weapon led to the development of the different stick fighting martial arts styles and techniques we know today. Escrima Stick Fighting became the norm. Eskrima sticks are generally made from rattan, a low-cost stem of a Southeast Asian plant. Durable and hard yet lightweight, it only tears up under the strongest impact and won’t splinter like the wood, making it safe for training. The standard escrima sticks length vary from 28″ to 32″ although the ideal length is one shoulder width apart. The ideal length would depend on the person’s height and that’s why the shoulder width measurement is used. Eskrima or stick fighting utilizes special sticks as weapons. There are many different variations of sticks used in Eskrima; each intended for specific purposes, like for training or demonstrations. Thus, it is crucial that you select the ones that suit your style and activity. You would not want to bring demo or practice sticks to a tournament. Moreover, you want to select first-class products such as those sold on Amazon to make sure that they don’t bend or break when you are using them against your opponent. Poorly-made sticks could result in accidents to you or your sparring partner. Also, for Eskrima – a full-contact martial art system that involves weapons – the likelihood for injury is immense anytime you compete or practice. Invest in your protection by buying the right and durable protective gear. Some sticks are designed for fighting. In fact, some are only made for practising, escrima sticks training, and demos. The majority of these are sold individually, but other like the Rattan Escrima are sold in pairs. They’re made from various materials such as fibreglass, bamboo, foam, and pine. It is crucial to make sure which type you need for your intended use. Being informed of the many key aspects in choosing your sticks can help to lessen your burden of looking through many choices. In choosing which Eskrima stick is perfect for you, you can select from different materials. Knowing what durable materials can go into your stick can and will a huge difference in your performance. Moreover, knowing what your training will look like can determine the number of sticks you may need when it comes to durability. When you are performing a full-contact sparring session, padded sticks is what you will need. But if you are working on power and speed, you will need a heavier stick. Plastic is often found in the padded version of Eskrima sticks. It is frequently described as a plastic core covered in padding. The core is usually a hollow PVC pipe or a hard plastic shaft. Plastic sticks are often lightweight, making it a perfect choice for training. PVC pipes don’t hold up as well against heavier strikes than others do. As a result, the type of material it is made up of the part the reason for its low cost. The foam is what the stick’s padding is made up of in most padded practice sessions. Often, the foam is a low-cost material that – when paired with the PVC – make for cheap training material. Meant for safer practice and training, it covers the core with foam. It is useful for full contact training without harming your sparring partner or yourself. Moreover, training with padded sticks is much quieter than the sound of wooden Eskrima sticks clashing at each other. Rubber serves as good reinforcement with numerous padded Eskrima sticks. In many cases, rubber makes up the surface area, which covers the foam padding. Also, it is not so expensive to produce, and the variety utilized in padded Eskrima sticks is very thin so as not to compromise the foam’s functionality. Polyester is the material used for the same purpose as Eskrima sticks. It is durable to use on the stick’s surface. Since polyester does not rip easily, it covers the padding firmly, keeping the foam intact. It looks great and is a safer choice than rubber. Rattan is a wood-like material gathered from a forest-dwelling plant. After the plant dies, its stems can become stiff, which resembles a stick made of wood. Rattan is known for its durability – more than plastic. It can even withstand an intense beating for a long period of time; especially after using fire to make it even harder. 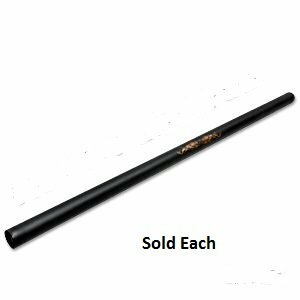 Rattan is what many authentic and high-quality Eskrima sticks are made from. Some practitioners use rattan covered with foam during full-contact training, which is a more durable option. It is more expensive than other options, but certainly better in quality. Bamboo is also wood-like grass similar to rattan. The plant is native to China and is basically what pandas eat. Bamboo is extremely lightweight and great to look at, which makes it an excellent choice for use in demos. Hardening it with fire not only makes it more durable but also more appealing to the eye. Specific types of wood make for heavy sticks. Wood-made sticks are often taken from a hickory tree’s oak. Heavier sticks are an excellent choice for power and speed enhancement, and even in fitness training. Several demonstration sticks are created from wood but painted in an extravagant manner. It frequently makes for a beautifully made stick all on its own, but it is not recommended for use in full contact training. Metal sticks are made mainly for strength and speed training. Traditionally, eskrima is practiced with lightweight rattan sticks, but the notion of utilizing heavy sticks has great applicability. The notion here is to get yourself accustomed to heavy sticks to build muscular strength. After getting used to the weight, you can return to using a lightweight stick, which gives you an increase in speed. There are many aspects to consider and select. Always remember what you need these sticks for because an experiened practitioner will inform you what kind of weapon to choose. The material will greatly affect the sticks in action. Knowing the properties of every material will provide anybody with a heads up when choosing the right stick for them. Because knowing is only 50% of the battle, looking through our criteria can finish your battle for you. Each piece of Arnis or Eskrima equipment used in sports such as Eskrima is expected to undergo a lot of action. That’s why to choose the best, well-made gear is to guarantee your safety. Though cheaper ones are easy to find, they lack the durability, and they also need constant replacement, eventually costing more. Poorly-made Eskrima sticks may even break during its first use. Pay very close attention to its material because this frequently determines what purposes they’re intended to withstand. Whether you are comparing sticks for training, competitions, or demos, look for quality Eskrima gear and equipment in various colors, styles, and materials. Find stores that provide sticks made from natural wood and foam. The options include rattan, bamboo, pine, and cocobolo in various lengths for competition or practice. Though martial arts equipment can be rather a costly investment, purchasing excellent quality products, give you protection and peace of mind that can make these stick worth the price. Although borrowing from the gym or club is an option, buying second-hand sticks, or sharing them has some disadvantages. When you make use of gear that somebody else has already used, you do not know just what kind of action it has experienced before. Also, Eskrima sticks used by numerous people are more likely to wear faster than those used only by a single individual. Escrima sticks may also be available in sports and martial arts stores near you. Arnis sticks for sale are not the only option though and you can customize your own weapon using other materials we’ve discussed earlier in this section, besides rattan. Two-Play Rattan Stick Set from the Philippine Islands! It includes two signature Filipino long sticks, rattan with burn patterns. They are fire-hardened and skin on for durable quality. It features a light clear coating. Sticks measure 29 inches by 1 inch in diameter. 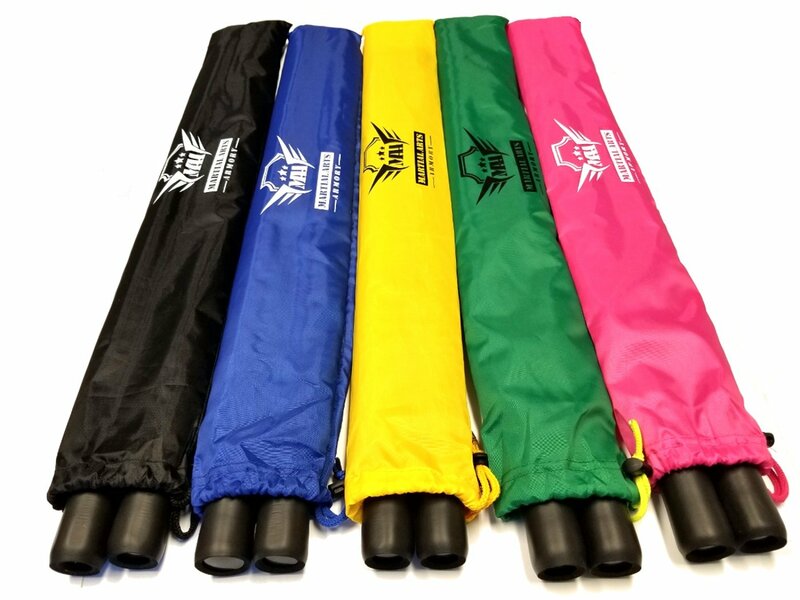 It also includes two Short Sticks without Skin and features decorative patterns for easy visibility once it hits and measures 8 inches and 7/8 inches. This a product straight from the cradle of Eskrima – the Philippines. The stick diameter may vary, measuring up to 1/8 inches. It features a hollow plastic core is protected with 1/4 inch black-coloured foam. It measures 26 inches long with a 1.25-inch diameter. 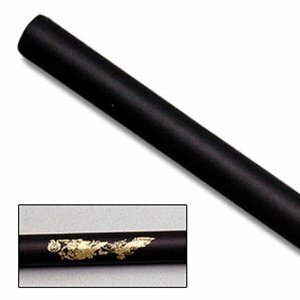 The foam cover is printed with a gold dragon at the centred on the stick. Black foam practice Escrima with a gold dragon design. Durable 1 1/4″ foam with PVC inner core. The Rubber Escrima stick is made of foam, measuring 26 inches in length and with a diameter of approximately 1.2 inches. It has a light plastic core with foam with rubber covering. It has round foam staff measuring 26 inches in length. Most used by FMA practitioners. perfect practice tool to master your Escrima skills and includes carrying case. Q: Do the sticks come in sets? A: Good question! That depends on the seller. Some sell the sticks individually for people who train with one hand or those who need a replacement. Others offer them in a pair for those who train with two hands. Some even sell them in couple sets, for those who train with a partner. Q: Is there a safe option for kids? A: Yes. Sellers advertise a scaled down stick for young fighters as well as the combat training sticks for expert practitioners. Full-contact sticks are often cheap, particularly plastic core ones. These are designed to keep sparring partners safe, and gear safe from wearing, and these also make them an ideal tool for children to practice at home. Q: Do materials impact the quality? A: Yes, they certainly affect it and determine it. PVC and plastic core will break if struck hard enough. Materials such as fire-treated wood and rattan are stronger and won’t break as easily. Thus, the difference in your weaponry will determine what you use it for. Q: Do the materials impact the cost? A: Yes because PVC and plastic cost less to manufacture than rattan sticks. Wood is quite cheap but can be expensive because of the further steps in its production such as treating the wood. Also, additional materials such as coverings, padding, and handle wraps will increase the cost as well. Many different vendors will price the sticks differently to profit, which is expected when you’re in business. Q: What’s the difference between Kali, Arnis, and Eskrima? A: There is so much debate over the difference between these three terms. These three martial arts are subcategories under FMA. Some say they are all the same – that the terms are different culture word for relatively the same thing. Others argue that they’re quite similar in a few aspects, but that kali and eskrima focus on the inclusion of the bo staff as well as the ethics and philosophy of the art. Today, Eskrima has moved from the bloody battlefields into the world of self-defence and sports. And in a society where it is illegal to carry guns and bladed weapons, the escrima stick becomes one of the most practical and flexible weapons you can use for self-defence. Any of the five best sticks listed in this article make a great choice for training. Which of the five models is your favorite? Feel free to share your thoughts in the comments.